Glass Bridge and Skylight - Kurt Krueger Architects, Inc. Walking on Air… an innovative way to bring light into a subterranean basement. Clients seek out architects who have experience with custom home design projects because they know the value of a unique, character home and they want to be able to have a home designed specifically for them and their needs. 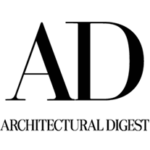 Clients who seek out architect-led, design-build firms like mine know the additional benefits of superior design coupled with construction; enhanced communication; and the smooth project timelines you have when working with one firm from start to finish–from design through construction. Such is the case with our clients at our Doheny project in west Los Angeles. They had some amazing ideas for how they wanted to use their home and some unique challenges my firm had to work through. For example, they wanted a space with a nightclub feel for entertaining. The subterranean basement was the perfect spot, but the family also wanted to use the space during the day and wanted to have exposure to the soft, northern light. Although this is a hillside basement, to get the feel the clients were after, the lounge was positioned on the backside. 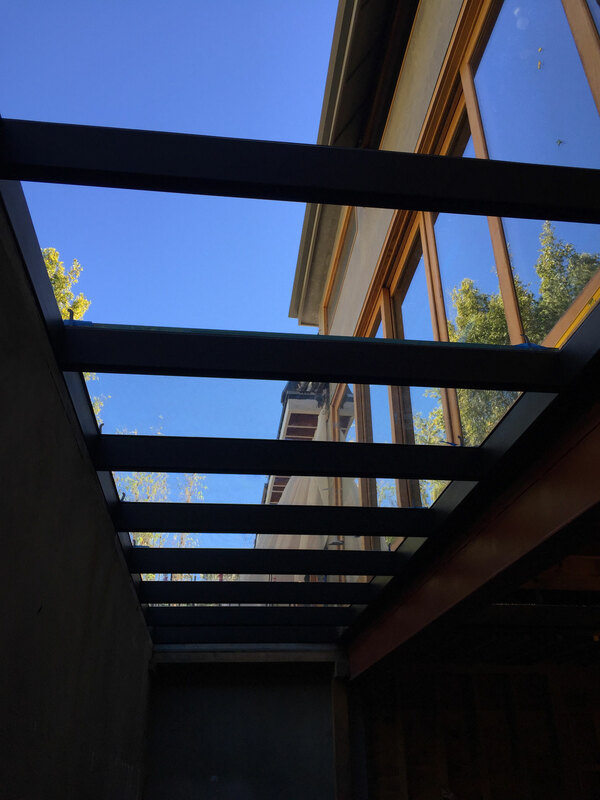 Getting in natural light to a space that is almost completely underground where windows aren’t a feasible option and designing for proper egress could be a challenge for a traditional architectural firm. So, how do you get natural light into a below-grade basement? The answer is a basement skylight. 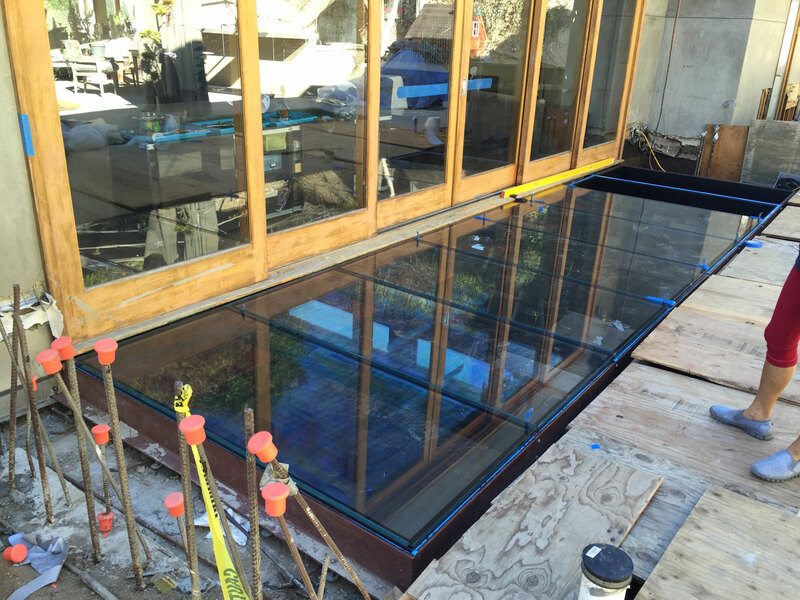 To bring in any meaningful amount of light into the basement, however, the expanse of glass has to be pretty large. Glass can blur the lines between indoors and outdoors and it can make a space feel more expansive. We designed the basement footprint to be slightly wider than the footprint of the first floor. 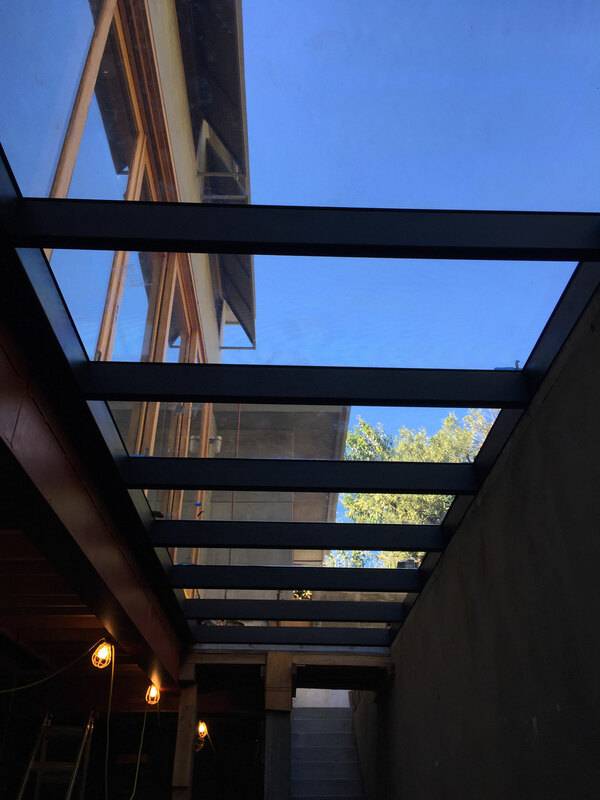 The skylight became part of the roof structure to the basement, but we also knew it had to be able to support foot traffic overhead at ground level. The skylight wasn’t in an out of the way place… just over the lounge is the living room with doors that lead out to the pool deck, therefore the skylight also has to function like a “bridge.” It had to be structural sound and a would be a key design feature to the overall aesthetic of the home. 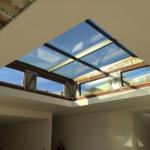 A basement skylight isn’t a common feature you see in residential architecture. Therefore we knew we needed to thoroughly understand all of the complexities of such a structure and to make sure to design something with the structural integrity to withstand being walked on, but also to make sure the glass wasn’t slippery because it would be exposed to the elements including water. We worked directly with the structural engineer from the beginning to design and approve both the steel supports and the structural glass. Being a design-build, architectural firm like mine means we have the in-house capability to design these types of unique features for our clients. Our experience in the field and the relationships we have with the trades means critical input from the beginning of the project on how to execute on these types of unique design ideas. There are a variety of coatings or slip-resistant materials you can apply to the glass surface. Obtain large samples of the glass prior to the final order. Although the small samples looked great, we noticed that some of the larger panels created wavy distortions and an oily effect rather than a clear glass to look up to the sky. Insist on larger samples before selecting the final material. An unexpected and unique design feature for a unique client, we’ve included some of the construction photos for how everything is coming together.